Cmaj7 is just C with your pointer finger up to make an open B string. The G is sometimes G6-ish I think. Kind of leave the top string open and/or don’t strum it much. 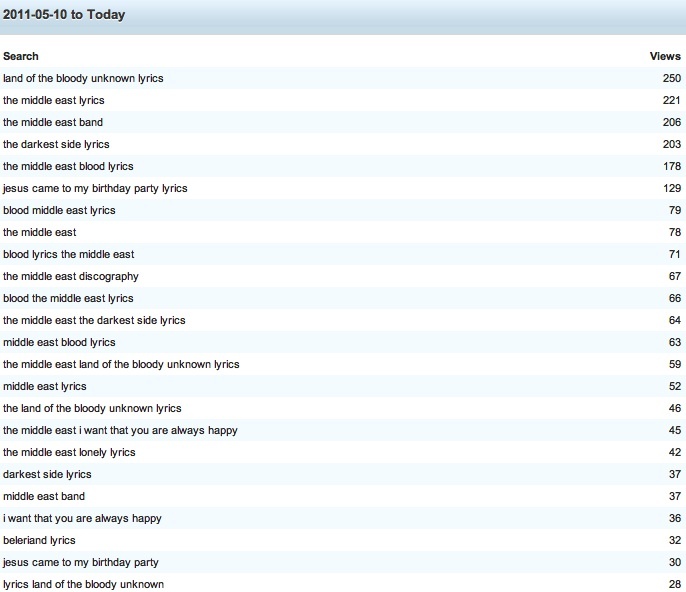 I’ll try not to bore you with this type of thing too often but I thought it was interesting that ‘land of the bloody unknown lyrics’ is now the top search query for this site. (The list shows what people type into google to get to pages on this site). There is a £2000 prize. Details here. At first I was unimpressed, but stick with it. It’s actually pretty good. Is this the best Blood cover yet? Here are some older ones for comparison. Update: And here are some newer ones. You are currently browsing the The Middle East blog archives for June, 2011.